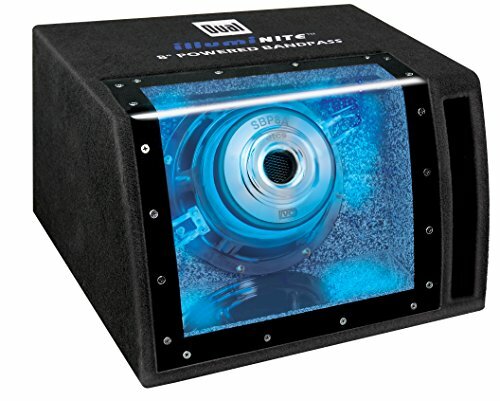 The Dual Electronics SBP8A 8 inch illumiNITE High Performance Powered Enclosed Subwoofer with Built-In Amplifier & 160 Watts of Peak Power is a force to be reckoned with. Your high performance sub with built-in amplifier was engineered specifically with you in mind. The specialized tuned port with computer aided design and 2” Voice Coils vastly increases output efficiency for your subwoofer providing you with consistent low sounding bass. Its computer-tuned acoustic chambers delivers up to 160 Watts of Peak Power, 80 Watts RMS at a 2 Ohm impedance and Frequency Range between 20Hz – 200Hz for unmatched output efficiency that suffices even bass enthusiasts. Your curved plexiglass viewing window and patent pending illumiNITE design is a showstopper by mesmerizing the senses with its intricate blue light display which allows for color coordinated installations. We designed your high performance sub to be installed easily by allowing accessible input terminal cups that connect to your system in seconds. The built-in Ventilated Control Circuitry System helps keep your system cool during peak usage for maximum bass output and hours of nonstop music entertainment. Our engineers made sure that your SBP8A was built with steel stamped & chrome backplate including a top grade in-line carpet that will eliminate the vast majority of enclosure movement for streamlined sound quality and unmatched sound superiority on the road. The Brushed Aluminum injection molded and Low-Q optimized subwoofer with their 30-ounce magnet provide excellent sound control and are built to last. Your built-in high performance Class B amplifier was designed for maximum output while requiring minimal energy input. In order to meet all your music needs your amplifier has all these features included: Low Level Inputs (RCA), High Level Inputs (Speaker), Variable Input Level Control, Variable Low Pass Crossover, Variable Phase Control and Barrier Strip Power Terminals. Please let me know once the changes have occurred and thank you in advance.